a Fundación Universitaria Konrad Lorenz, Bogotá, Colombia. Online psychological interventions for the treatment of depression are increasing as an alternative to traditional face-to-face psychotherapy. Adaptations of cognitive behavioral therapy for the treatment of depression have been tested, with meta-analyses showing weighted effect sizes ranging from d = 0.40 to 0.56. However, there is less evidence on the effect of adaptations of third-wave behavioral therapies for depression. Accordingly, this study reviews the evidence of online applications of third-wave behavioral therapies for depression. Nine randomized clinical trials were found with a total of 1910 participants. Most of these trials implemented online versions of behavioral activation (BA) and acceptance and commitment therapy (ACT). All studies reported positive effects of third-wave therapies. A meta-analysis was conducted with the 6 studies (N = 1744) that compared an online intervention versus wait-list or treatment as usual conditions. Medium to large effect sizes were found with a weighted effect size of d = 0.61. In conclusion, online adaptations of third-wave therapies seem to be legitimate options for the treatment of depression. Las intervenciones psicológicas online para el tratamiento de la depresión están creciendo como una alternativa a la psicoterapia tradicional vis a vis. Se han evaluado adaptaciones de la terapia cognitivo conductual para el tratamiento de la depresión, señalando los meta-análisis tamaños del efecto promedio entre d = 0.40 y 0.56. Sin embargo, existe menor evidencia acerca de los efectos de adaptaciones de las terapias conductuales de tercera generación para la depresión. Consecuentemente, este estudio revisa la evidencia de las aplicaciones online de terapias conductuales de tercera generación para la depresión. Se encontraron 9 estudios clínicos aleatorizados con un total de 1910 participantes. La mayor parte de los estudios aplicaron versiones de la activación conductual y la terapia de aceptación y compromiso. Todos los estudios reportaron efectos positivos de las terapias de tercera generación. Se realizó un meta-análisis con los 6 estudios (N = 1744) que compararon una intervención online versus un control en lista de espera o tratamiento habitual. Se encontraron tamaños del efecto entre medianos y grandes, con un tamaño del efecto promedio de d = 0.61. En conclusión, las adaptaciones online de terapias de tercera generación parecen ser una opción legítima para el tratamiento de la depresión. According to the World Health Organization (WHO), at least one in every ten people suffer from unipolar depression (approximately 676 million), which makes depression the most prevalent mental disorder and the third most disabling health condition in the world (World Health Organization, 2008, 2016). Psychological treatment is the first and most recommendable intervention for depression, and its early implementation shows greater efficacy and significantly prevents chronicity and/or relapse (Cuijpers, Andersson, Donker, & Van Straten, 2011). Global estimations from the WHO's Mental Health Atlas (2011) show that only 0.38% of the population receives any kind of intervention for mental disorders. This contrasts with the high lifetime prevalence of depression, with global estimates from 10 to 15% of the general population (Moussavi et al., 2007). The low level of use of mental-health services might be due to the relative difficulty to access them in some particular contexts (i.e., spatiotemporal, geographical, economical, and geopolitical issues). At the dawn of the digital era (i.e. the late 90's), online psychological interventions were proposed as a promising alternative for conventional interventions. Barak, Klein, and Proudfoot (2009) classified the existing research on this subject in four categories: (a) web-based interventions (self-help interventions with therapeutic support), (b) online counseling and therapy (one-to-one therapy), (c) Internet-operated therapeutic software (automatic self-help software), and (d) supplements to other interventions. These alternative interventions should be efficient, ethical, of high quality, evidence-based, broader, empowering, and encouraging for the users (Eysenbach, 2001). General reviews on the efficacy of online psychological interventions show that they are a legitimate therapeutic activity and constitute a promising alternative to traditional psychotherapy (Barak, Hen, Boniel-Nissim, & Shapira, 2008) as well as a powerful tool for the prevention of mental disorders in general (Ebert, Cuijpers, Muñoz, & Baumeister, 2017). With regard to unipolar depression, most of the online interventions have been adaptations of cognitive behavioral therapy (CBT) and interpersonal therapy (IPT). Several reviews of the effect of CBT-oriented online interventions for depression have found significant reductions of symptomatology, high levels of satisfaction and cost-effectiveness among participants. Across the different me-ta-analyses (Andersson & Cuijpers, 2009; Richards & Richardson, 2012; Spek et al., 2007), effect sizes for depression were medium (d = 0.40 to 0.56). Spek et al. found that effect sizes differed depending on the support (e.g., feedback and reminders) provided by the intervention, with large effect sizes for interventions with support and small effect sizes for interventions without it. The third wave of behavioral and cognitive psychotherapies, or contextual CBT (Hayes, Villatte, Levin, & Hildebrandt, 2011), is a diverse group of empirically supported treatment approaches (Dimidjian et al., 2016) that includes acceptance and commitment therapy (ACT; Hayes, Strosahl, & Wilson, 1999), functional analytic psychotherapy (FAP; Kohlenberg & Tsai, 1991), behavioral activation (BA; Martell, Addis, & Jacobson, 2001), dialectical behavioral therapy (DBT; Linehan, 1993), metacognitive therapy (MCT; Wells, 2009), mind-fulness-based cognitive therapy (MBCT; Segal, Williams, & Teasdale, 2002), and rumination-focused cognitive-behavioral therapy (RF-CBT; Watkins, 2016). These approaches focus on the functions of private experiences rather than their form, frequency or "rationality." Third-wave interventions differ from one another conceptually and methodologically, but they share at least three common therapeutic objectives: opening client towards her own experience, becoming aware of her own behavior, and promoting valued actions in the presence of any private experience (Hayes et al., 2011). The development of online, third-wave interventions for depression has grown in recent years, albeit the research volume is still limited. Existing reviews (Brown, Glendenning, Hoon, & John, 2016; Cavanagh, Strauss, Forder, & Jones, 2014; Spijkerman, Pots, & Bohlmeijer, 2016) focused on a single kind of intervention (i.e., MBCT, ACT) as applied to multiple types of problems. However, the effect of online, third-wave interventions for depression has not been specifically reviewed. Accordingly, the present review/me-ta-analysis aims to analyze the current empirical evidence of online, third-wave treatments for depression. Studies regarding the treatment of depression by means of third-wave approaches presented through virtual media were identified using the following strategies. Firstly, the bibliographic database Scopus was searched at the end of November 2016, using the following command: ("Internet" OR "Web-based" OR "online") AND ("depression") AND ("Acceptance and commitment therapy" OR "Behavioral Activation" OR "Behavioral Activation" OR "Mindfulness" OR "Meta-cognitive Therapy" OR "Dialectical Behavioral Therapy" OR "Rumination-Focused Cognitive-Behavioral Therapy"). Secondly, the first and third authors reviewed the search output and selected the articles that met the inclusion criteria (see below). Third, reference lists from articles that met inclusion criteria for full-text review were examined as well. Lastly, the reference lists of existing reviews and meta-analyses on the matter were also reviewed (i.e., Brown et al., 2016; Cavanagh et al., 2014; Spijkerman et al., 2016), as well as webpages related to third-wave therapies (e.g., www.contextualscience.org). This review included studies that present any kind of third-wave cognitive behavioral intervention designed for the treatment of depression through virtual media (i.e., Websites, email, mobile phone applications). Studies presenting depression measures as secondary outcomes (e.g., clinical studies on anxiety disorders, wellbeing, health issues, etc.) were excluded from this review. Studies that presented the development of the intervention protocol but did not report outcomes were also excluded. Due to limitations in the languages spoken by the authors of this research, only studies written in English or Spanish were taken into consideration. Treatment, participant, methodological, and extrinsic variables were coded in order to analyze the characteristics of the studies that could be correlated with the effect size magnitude. 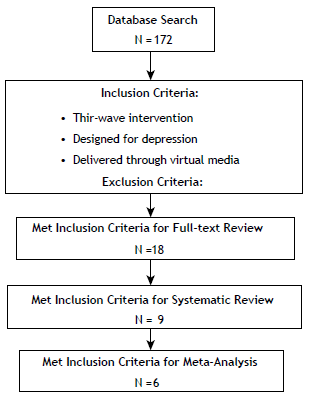 The treatment characteristics coded were: (a) type of third-wave intervention implemented, (b) number of sessions/modules and overall duration of the interventions in weeks, (c) type of virtual media used to deliver the intervention. The participant characteristics coded for the sample of each study were: (d) mean age in years, (e) percentage of females, and (f) total sample size. The methodological characteristics were coded as follows: (g) design type, and (h) last follow-up in months. Finally, the extrinsic characteristics coded were: (i) year of publication, and (j) country and continent in which the study was conducted. Controlled between-group effect size biases corrected for small samples (Hedges's g; Hedges, 1981) were computed on all outcome and process measures at pretreatment, posttreatment, and the last follow-up. The first author of the study was requested to provide the necessary raw data to compute g whenever the article did not contain them. Primary outcomes were used to established measures of depression (e.g., Beck Depression Inventory, Center for Epidemiologic Studies - Depression, etc.). Effect sizes were computed so that positive effects represent better results for the third-wave interventions and negative effects represent better results for the control conditions. Hedges's g effect sizes were interpreted using Cohen's rule-of-thumb of small (0.2), medium (0.5), and large (0.8) effects. The meta-analyses were conducted with Comprehensive Meta-Analysis Version 3.0 (CMA, Biostat). Since heterogeneity between the included studies was expected, the summary effect and 95% confidence intervals were calculated according to a random effects model, which assumed that studies differ from each other as a result both of random error within studies and of systematically true variation in effect sizes between studies (Borenstein, Hedges, Higgins, & Rothstein, 2009). Importantly, the random effects model yields the same results as the fixed effects model in the absence of heterogeneity, so that random effects models were used even in the cases in which heterogeneity was nonsignificant. The Q statistic was used to test for heterogeneity, and the I2 index to assess the degree of the effect size heterogeneity around the mean effect (Cooper, Hedges, & Valentine, 2009). Following the suggestion of Higgins, Thompson, Deeks, and Altman (2003), values of 0, 25, 50, and 75% in the /2 statistic were considered as indicative of no, low, moderate, and high heterogeneity, respectively. Figure 1 shows the results of the search conducted. The search in databases yielded a list of 172 studies. Eighteen studies met the inclusion criteria for full text review. Nine studies were excluded during full text review: Four were open trials (Burns et al., 2011; Felder et al., 2016; Murray et al., 2015; Spates, Kalata, Ozeki, Stanton, & Peters, 2013), two referred to an online intervention for suicidal thoughts that included depression score as a secondary outcome (Van Spijker, Van Straten, & Kerkhof, 2014, 2015), one was designed for the treatment of comorbid depression symptoms in individuals already diagnosed with epilepsy (Thompson et al., 2010), one was meant to reduce residual symptomatology after psychological intervention (Dimidjian et al., 2014), and a last one assessed the efficacy of a MBCT online protocol on mixed depression and anxiety (Krüsche, Chylarova, & Williams, 2013). Figure 1 Study Inclusion Flowchart. Nine randomized controlled trials (RCTs) met the inclusion criteria and were included in this review. Seven of them had two arms: Five included a wait-list control (WLC) group and two had another active intervention as comparison. The remaining two RCTs had three arms corresponding to two experimental groups and a WLC group. All of them were conducted in Europe: two in Sweden, two in Finland, two in the Netherlands, two in the UK, and one in Germany. The main ethical concerns about research in online psychological therapy relies on the difficulties associated with the information management and privacy, informed consent signing, verification of the participants' identity, and therapeutic alliance (Childress, 2000; Kotsopoulou, Melis, Kout-soumpou, & Karasarlidou, 2015). The nine RCT's included in the present review reported approval by an institutional Ethics Committee and the trials were registered. All studies protected their participant's identities by the creation of unique sets of exclusive usernames and passwords. Those security systems were safely programmed by professional engineers from every research group. All studies obtained informed consent. One study conducted an evaluation and debriefing session before giving participants access to the intervention program (Lappalainen et al., 2014). In another study, the informed consent was sent to the participants through conventional mail and they returned it signed before having access to the intervention (Eisma et al., 2015). The remaining studies collected the informed consents through virtual media by simply clicking on a button on the platform. Participants could not contact the other participants, nor could they access their personal or progress information. None study reported how they excluded underage participants. All studies included in this review measured depression by means of a well-established self-report measure (see Table 1): five studies used the Beck Depression Inventory - II (BDI-II; Beck, Steer & Brown, 1996); two studies used the Edinburgh Postnatal Depression Scale (EPDS; Cox, Holden, & Sagovsky, 1987); one study used the Center for Epidemiological Studies - Depression Scale (CES-D; Radloff, 1977), and one used the Inventory of Complicated Grief-Revised (ICG-R; Prigerson & Jacobs, 2001). Table 1 presents the main characteristics of the described studies; first author, year of publication, country of application, type of third-wave intervention used, delivery mode (i.e., website, smartphone app), primary outcome, general results, number of sessions or modules, duration in weeks of the intervention, sample size before randomization, attrition rates at posttreatment, mean age of the participants, and percentage of females among them. Table 1 Main Characteristics of the Reviewed Studies. Note. * = Studies included on the meta-analysis; ACT = Acceptance and Commitment Therapy; BA = Behavioral Activation; BDI-II = Beck Depression Inventory - II; CBT = Cognitive Behavioral Therapy; CES-D Center for Epidemiological Studies - Depression; EPDS = Edinburgh Postnatal Depression Scale; ICG-R = Inventory of Complicated Grief-Revised; MBCT = Mindfulness-Based Cognitive Therapy. Lappalainen et al. (2014) conducted a two-arm RCT comparing two experimental conditions that applied ACT: online therapy versus face-to-face therapy (N = 38). The online intervention consisted of six weekly modules featuring ACT-based exercises and content on a website. The screening process consisted of a structured interview delivered on the phone designed for the study that explored symptoms of depression. Participants in the online condition received extensive support (reminders and feedback) and two face-to-face sessions with a therapist at the start (general assessment and contextualization) and the end of the intervention (debriefing and experience evaluation). However, those two face-to-face sessions had no therapeutic content. The primary outcome was the BDI-II, and 6- and 18-month follow-ups were conducted. Furthermore, 97.3% of the participants completed the intervention (N = 37) and 92.1% provided 18-month follow-up data (N = 35). Depressive symptomatology significantly decreased in both groups at posttreatment with few differences between treatments (d = -0.15). The gains were maintained at the follow-ups, with the online interventions showing significantly better results in the reduction of depression (6-month follow-up: d = 0.78; 18-month follow-up: d = 0.51). The within-group effect sizes for the online condition were large (d = 1.19). Lappalainen, Langrial, Oinas-Kukkonen, Tolvanen, and Lappalainen (2015) conducted a two-arm RCT comparing the online ACT intervention developed by Lappalainen et al. (2014) versus a WLC (N = 39). However, in this study, participants had minimal support consisting of automated generic reminders and feedback without further contact with the research team (i.e., the participants never had face-to-face contact with them). The screening process consisted of a structured interview based on the Diagnostic and Statistical Manual of Mental Disorders (DSM-IV-TR; APA, 2000). The outcome measure was the BDI-II. In this study, 97.4% of the participants completed the intervention (N = 38). There was a significant decrease in depressive symptoms at posttreatment (d = 0.63). In addition, 50% of participants met the criteria for remission according to Jacobson and Truax (1991). Pots et al. (2016) conducted a three-arm RCT comparing ACT, Expressive Writing, and a WLC (N = 236). The interventions lasted up to 12 weeks and consisted of nine modules divided into three parts. The expressive writing condition consisted of a blog based on Pennebaker (1997), where participants had to write about emotional experiences for 1530 min on at least 3 days per week. The ACT intervention was based on the protocol developed by Kelders, Pots, Os-kam, Bohlmeijer, and Van Gemert-Pijnen (2013). Participants received reminders and feedback at the end of each module. The screening process consisted of (a) a battery of self-report psychometric instruments presented to the participants within the website after giving their virtual informed consent, and (b) the Mini International Neuropsychiatric Interview (MINI; Sheehan et al., 1998) delivered through a phone-call. The participants never had face-to-face contact with the research team. The CES-D was the outcome measure. In this case, 51.2% of the participants responded to CES-D at the end of the intervention (N = 121), 53.3% provided 6-month follow-up data (N = 126), and 50% provided 12-month follow-up data (N = 118). For the ACT condition, there was a significant decrease of the depressive symptomatology at posttreatment (ACT vs. EW: d = 0.35; ACT vs. WLC: d = 0.56) that was maintained at the 6- and 12-month follow-ups although differences among conditions were lower (ACT vs. EW at 6-month follow-up: d = 0.17; ACT vs. WLC at 6-month follow-up: d = 0.32; ACT vs. EW at 12-month follow-up: d = -0.01). O'Mahen et al. (2013) conducted a two-armed RCT with a treatment-as-usual (TAU) control group (N = 910). The intervention was designed for women presenting depressive symptomatology after childbirth (only women who gave birth to children born alive were included). Women in the TAU condition received only the usual hospital care. The intervention consisted of 11 weekly modules on a virtual platform based on BA. The intervention focused on symptom reduction and the reinforcement of the mother-child bond. Participants received reminders of the activities but there was no feedback. The screening process consisted of the virtual delivery of the EPDS scale, after giving digital informed consent on the intervention website. The women never had face-to-face contact with the research team. The EPDS was the outcome measure. Attrition rates were high for this study, 62.3% of the participants did not provide post-treatment data. There was a significant decrease in the symptomatology at posttreatment favoring the BA condition (d = 0.54). O'Mahen et al. (2014) conducted another two-arm RCT with women presenting depressive symptomatology after childbirth (only women who gave birth to children born alive were included) randomized to an experimental group and a TAU control group (N = 83). This study used the protocol developed by O'Mahen et al. (2013). Participants received extensive support consisting of weekly phone calls providing feedback on their activities and e-mail reminders. The screening process was identical to the latter study, but also included a structured interview based on the ICD-10 classification of mental and behavioral disorders (World Health Organization, 1992) delivered by phone-call. The women never had face-to-face contact with the research team. The EPDS was again the outcome measure. In this case, 85.5% of the participants completed the intervention (N = 71) and 71% provided follow-up data (N = 59). There was a significant decrease of the symptomatology at posttreatment (d = 0.65) that was maintained at the 6-month follow-up (d = 0.48). Eisma et al. (2015) conducted a three-arm RCT with a WLC group and two experimental groups (Exposure and BA) (N = 47). Both interventions were designed for individuals presenting ruminative responses during grief, lasted 6 to 8 weeks, and consisted of six weekly e-mail-delivered assignments. The exposure condition was an online adaptation of the protocol by Boelen, De Keijser, Van Den Haut, and Van Den Bout (2007), focused on reducing avoidance by gradually exposing the participants to the aversive aspects of their loss. The screening process consisted of a semi-structured interview delivered by phone-call in which the inclusion criteria were re-assessed and another explicit informed consent was provided (besides the one sent by e-mail and regular mail). The participants never had face-to-face contact with the research team. The ICG-R was the primary outcome measure. Participants did not receive reminders but had feedback on their assignments. In this study, 76.5% of the participants completed the intervention (N = 36) and 70.2% provided follow-up data (N = 33). This study presented a methodological problem because the mean scores in depression at pretreatment were considerably higher for the BA condition. For this reason, it was not included in the meta-analysis. The authors computed a version of Cohen's d that controlled for this difference at pretreatment. There was a significant reduction of symptomatology at posttreatment for both treatments in comparison to the WLC (BA: d = 0.92; Exposure: d = 0.79) but there were no significant differences between the interventions. In the BA condition, the change was maintained at the 3-month follow-up. Carlbring et al. (2013) conducted a two-arm RCT with a WLC (N = 80). The intervention included components both of BA and ACT and was implemented in 7 weekly modules. The participant could freely advance throughout the program. There was minimal support consisting of motivational feedback on the exercises conducted in each module. The screening process consisted of (a) a battery of self-report psychometric instruments presented to the participants within the website after giving their virtual informed consent, and (b) the A module of the Structured Clinical Interview for DSM-IV - Axis I disorders (SCID-I; First, Gibbon, Spitzer, & Williams, 1997) delivered through a phone-call. The participants never had face-to-face contact with the research team. The outcome measure was the BDI-II. The percentage of participants that competed the intervention and provided follow-up data was 97.5% (N = 78). Results showed a significant reduction of depressive symptomatology at posttreatment according to the BDI-II (d = 0.86). Ly et al. (2014) conducted a two-arm RCT comparing BA and MBCT delivered through a mobile phone application (N = 81). Both interventions lasted 8 weeks and were administered sequentially (i.e., participants could not skip any parts of the program). Participants received reminders and feedback on their activities. The screening process consisted of (a) a battery of self-report psychometric instruments sent to the participants via e-mail after giving their virtual informed consent, and (b) the MINI (Sheehan et al., 1998) delivered through a phone-call. The participants never had face-to-face contact with the research team. The outcome measures were scores on the BDI-II and the Personal Health Questionnaire - 9 (PHQ-9; Kroenke, Spitzer, & William, 2001), however, only the results in the BDI-II were considered because it is a better-established measure of depression and four other studies also included it. In this work, 88.8% of the participants completed the intervention (N = 72) and 85.1% provided follow-up data (N = 69). Results at posttreatment (d = 0.24) and 6-month follow-up (d = 0.03) were in favor of the BA condition, but the difference was not statistically significant. The symptom level at pretreatment moderated the effect of the interventions. Specifically, the BA condition showed a greater symptom decrease for participants with higher scores at pretreatment (within-group effect size at posttreatment: d = 1.8; within-group effect size at the 6-month follow-up: d = 1.17), whereas the MBCT condition showed a greater symptom decrease for participants with lower symptom scores (within-group effect size at posttreatment: d = 1.19; within-group effect size at the 6-month follow-up: d = 1.07). Meyer et al. (2009) conducted a two-arm RCT with a WLC (N = 396). The intervention lasted 9 to 10 weeks and consisted of 10 modules presented on a virtual platform based on various approaches (BA, MCBT, and CBT). The screening process consisted of a battery of self-report psychometric instruments presented to the participants within the website after giving their virtual informed consent. The participants never had face-to-face contact with the research team. The BDI-II was the outcome measure. Participants did not receive reminders or feedback. Attrition rates were high for this study (45.4% of the participants did not provide post-treatment data). Results showed a significant reduction of depressive symptomatology at posttreatment (d = 0.63). For the meta-analysis, we computed the weighted effect sizes of the third-wave online interventions versus the WLC and TAU conditions. Table 2 presents statistical data for the studies included in the meta-analysis. Medium to large effect sizes favoring the third-wave online interventions were found in each study. Meta-analytic data show a statistically significant medium effect size (d = 0.61, SE = 0.07; 95% CI [0.47, 0.75], p < .001). Figure 2 shows a graphic representation of the effect sizes. Heterogeneity was null (Q = 1.61, p > .05), and there was no significant heterogeneity of the effect size around the mean effect (I 2 = 0%). Table 2 Meta-Analysis Statistical Data. Note. ACT = Acceptance and Commitment Therapy; BA = Behavioral Activation; BDI-II = Beck Depression Inventory - II; CES-D Center for Epidemiological Studies - Depression; EPDS = Edinburgh Postnatal Depression Scale; Std diff = Standard difference; TAU = Treatment as Usual; WLC = Wait-List Control. Figure 2 Forest Plot Graphic for the Selected Studies. Note. CI = Confidence interval; Std diff = Standard difference. Nine RCTs that explored the efficacy of a third-wave online intervention for depression have been reviewed. All studies were conducted in northern Europe. Most of the studies tested ACT or BA interventions and used the BDI-II as primary outcome measure. The average duration of the interventions was 8.8 weeks and included a mean of 7.4 modules. The sample sizes varied widely: from 38 (Lappalainen et al., 2014) to 910 participants (O'Mahen et al., 2013). In all the studies included, participants remained anonymous in the virtual platform and their personal information was protected by a username-password system. Also, seven out of nine studies selected delivered the intervention program through a website, which seems to offer more flexibility to monitor the participants' progress and develop the intervention program itself. All studies reported positive results in terms of the efficacy of third-wave interventions for depression. A meta-analysis was conducted with the six studies that compared the effect of a third-wave intervention for depression against a WLC or TAU. Two studies tested the efficacy of ACT interventions (Lappalainen et al., 2015 ; Pots et al., 2016) and another two studies tested BA (O'Mahen et al., 2013, 2014). The remaining two studies tested a combination of ACT and BA (Carlbring et al., 2013) and a combination of BA, MBCT and CBT (Meyer et al., 2009). Medium to large effect sizes were found across studies (from d = 0.55 to 0.86) and a weighted effect size of d = 0.61. There was very little variability across studies. Some limitations of the current empirical evidence are worth mentioning. Firstly, previous research on CBT has shown that the type of support moderated the effect sizes for the online interventions. However, due to the limited amount of studies included in the meta-analysis, moderation analyses could not be conducted in this study. Further research might explore this issue and establish what type of support is more adequate for third-wave online interventions for depression. Secondly, few third-wave interventions have been implemented through the Internet, as most of the studies relied on BA and ACT. Further research might explore the feasibility and efficacy of other third-wave approaches and make empirical comparisons among them. Thirdly, all studies were conducted in northern Europe, which hinders the extrapolation of these results to other contexts with different cultures such as Latin Europe, Latin American, or Asian countries. Future research might explore whether third-wave online interventions are efficacious in these contexts, where social connectedness is usually more important (e.g., Allik & Realo, 2004). The current empirical evidence is supportive of the efficacy of third-wave interventions implemented through the Internet (mostly BA and ACT). The Internet can be a very useful way of delivering psychological interventions due to its easy access and good cost-effectiveness relation. Thus, the design and application of online psychological interventions might contribute to increase mental health and quality of life on a global scale. Further research might explore the efficacy of online third-wave interventions in other geographic zones and cultures. Also, research might investigate the moderator and mediator variables of the third-wave interventions for depression delivered through virtual media. Este artículo de investigación ha sido financiado a través del Proyecto SEJ 2004-07311/EDUC perteneciente al Plan Nacional de Investigación Científica, Desarrollo e Innovación Tecnológica del Ministerio de Educación y Ciencia, concedido al último autor.